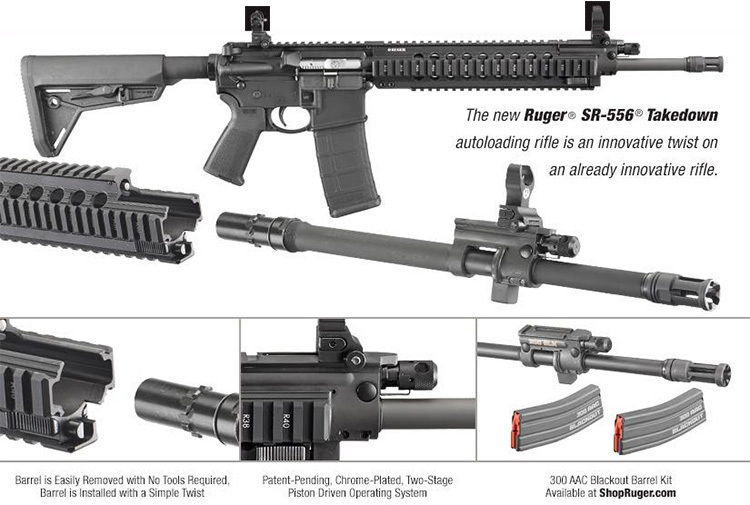 New to Ruger’s line of SR-556 rifles, is the new Ruger SR-556 Takedown AR15 rifle. We feel that this new “takedown” rifle may be a unique option for hunters who travel into the back country to hunt game. Weighing in at 7.6 pounds, without optics, this AR15 is a bit on the heavy side. But, having the ability to break it down and store it in a backpack, or small case for transport, makes this rifle a strong contender for those who like compact and portable. For those looking to hunt big game, while on the move in the back country, this may be a great choice. However, with the suggested retail price at $2049.00, it may be a tough price to swallow for your average hunter. There is also a .300 AAC Blackout barrel kit available to quickly change calibers. The takedown barrel is removed from the upper receiver by simply moving the slider bar towards the breech, rotating the barrel and pulling it free – no tools required. Installation is simpler yet – just slide the barrel into the upper and twist until it locks. The takedown mechanism provides a repeatable point of impact. 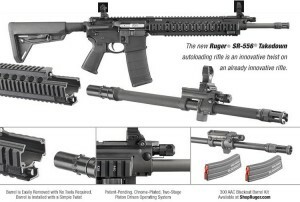 MSR shooters that desire a larger cartridge will be excited to find that a replaceable barrel kit chambered in 300 AAC Blackout is available on ShopRuger.com. This range-ready barrel’s headspace is set at the factory and comes complete with a metal flip-up elevation & windage adjustable front sight and two, 30-round metal magazines marked with “300 AAC BLACKOUT” to ensure easy differentiation. The Ruger® Elite 452™ AR trigger is a two-stage trigger that offers a smooth, crisp, 4.5 lb. trigger pull. The Ruger Elite 452™ features a full-strength hammer spring for consistent primer ignition and a lightweight hammer that enables a 30% faster lock time over standard MSR triggers. With front and rear folding iron sights, the SR-556® Takedown is ready to go to the range right out the box. The front sight is both elevation & windage adjustable, meaning that when you swap barrels, the zero stays with the barrel. The lower receiver is fitted with the Magpul® MOE grip and MOE SL collapsible buttstock on the mil-spec buffer tube. With a length of pull ranging between 11.1″-14.4″ the fit can be perfect for most any shooter. Precision-rifled, chrome-lined, cold hammer-forged Mil-Spec 41V45 chrome-moly-vanadium steel barrel ensures accuracy and longevity. A Ruger® flash suppressor is provided and the ½”-28 threaded barrel allows for standard muzzle accessories to be installed. Supplied with three Magpul PMAG® 30-round magazines (a lightweight 556 NATO magazine). Also includes a rugged, ballistic nylon case; three rail covers and lock.